More than a few threads on the SWTOR forums express confusion over how common each mission discovery can be. 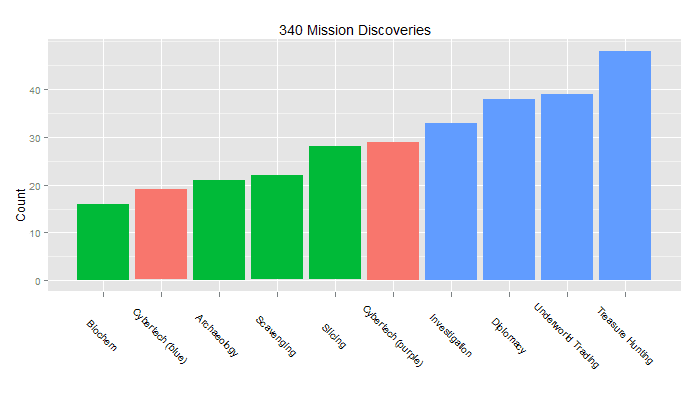 To clean up a bit of confusion, I collected data on 300 mission discoveries via slicing. These discoveries are exclusively from the Rank 6 Abundant/Moderate lockbox missions and the Rank 5 Rich lockbox missions. These missions were predominantly run with companions at 10k affection, though I did put the ship droid to work on a few. Before gathering the data, I'd have sworn that the purple cybertech patterns or the investigation missions were the most common. One pattern is immediately clear: the gathering mission discoveries (green) are much less common than the pure 'mission' discoveries' (blue). The gathering crewskill discoveries are about half as likely as the mission crewskill discoveries. Since the pure mission crew skills each have two possible level 340 discoveries, while the gathering skills only have one, this makes some intuitive sense, and would imply that any particular 340 mission has a 7% chance of occurring on a crit. I'm actually struck by how infrequently the Cybertech patterns drop. I'd have sworn that I was swarmed by them (ditto with investigation), but constantly in need of more Treasure Hunting missions. I'm also struck by the frequency of slicing discoveries - another mission I'm always running. Go figure. *Stats-nerds: Pearson chi-squared test within each group.